Description: Never heard of a motorcycle wedding? This loving couple likes to live fast, and with the fashion to match, their honeymoon adventure starts with weaving through traffic! 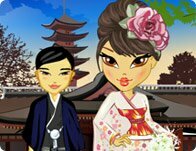 Instructions: Use your mouse to click on and through the floating clothing, hair, background, bouquet accessories and motorcycle options for a motorcycle wedding!